A walk of the gardens at Mount Congreve with Michael White, the Garden Curator, always brings out great stories and connections. Michael walks at a gallop and talks at a gallop because he has much to do and his head is so full of information that it seems to simply burst from him. I recall asking him the name of an attractive rhododendron on one occasion and while I was given the name I was also given its parentage and its grand-parentage and the names of all the people and gardens who had been involved in the background of the plants along with the dates of each generation along its breeding and when it was introduced to the gardens at Mount Congreve, where it had come from, and when it first flowered. Yes, a walk with Michael leaves my old legs tired and my old brain somewhat frazzled but I wish I could have such a walk every day of the week as each one reveals another layer of Mount Congreve Gardens and there are few places I would rather be. Molly’s Walk is at the far side of the garden, a quieter end, and few garden visitors walk so far. Earlier in the week Michael insisted we had to come with him to see the stand of Rhododendron montroseanum which grows there as he reckoned he had never seen it flowering so well. This was a result, he speculated, of the extra light allowed into this area when sheltering trees were blown down in the storms of early 2014. I had visited Molly’s Walk at this time last year and felt the rhododendrons had looked wonderful but they were certainly significantly better this year with all shrubs fully clothed in their beautiful blooms. It was a great display and worth the walk/gallop. Rhododendron montroseanum is a large shrub with a height and spread at present in Mount Congreve of about four metres. The leaves are long and stiff, a deep glossy green and have a whitish indumentum on the back while the inflorescence is a rounded collection of individual flowers which are pale pink with a crimson/purplish blotch in the throat. Planted in a large group, as they are at Mount Congreve, they make an impressive display. This rhododendron seems to occur in the wild only in the Tsangpo Gorge in Tibet. This gorge, by the way, is regarded as the deepest in the world and at 504km is longer that the Grand Canyon in the USA. The plant collector Frank Kingdon-Ward collected seed there and a specimen raised from this seed was cultivated at Brodick Castle on the Isle of Arran in Scotland. Brodick is an impressive red sandstone castle with sections dating to the thirteenth century and was the property of the Dukes of Hamilton and was passed from the 12th Duke to his daughter, Lady Mary Louise Douglas-Hamilton (1878 – 1957), who later became the Duchess of Montrose. The gardens at Brodick were started in the 1920 by Lady Mary Louise who was an enthusiastic gardener and collector and passed to the government on her death in lieu of death taxes and are now in the hands of the National Trust for Scotland, an estate of 7,000 acres with gardens of 65. 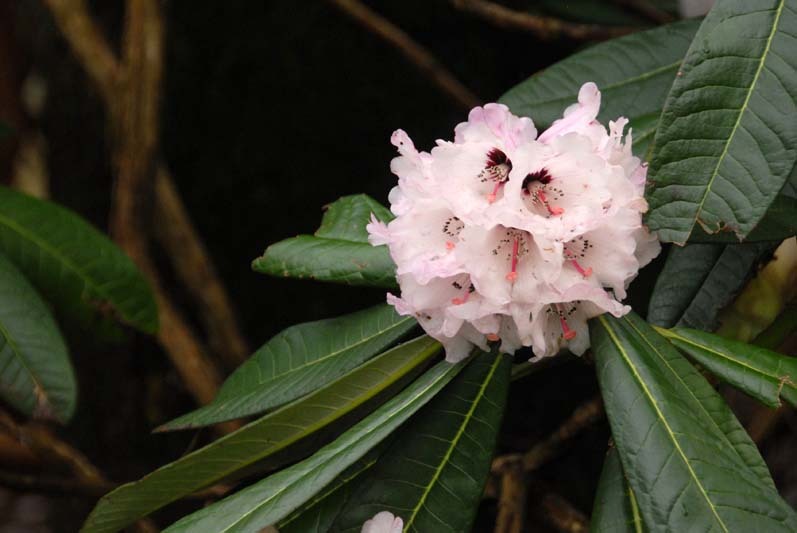 Lady Mary Louise’s name to her family members and friends was “Molly” and the newly introduced rhododendron was initially named Rhododendron mollyanum but later Rhododendron montroseanum. So, this planting and this walk, Molly’s Walk, in Mount Congreve remembers a wonderful lady – wonderful not alone because of the gardening heritage she passed to the state but also for the great deal of charitable work in which she was involved. One commentator remarked that one was likely to meet her one day making tea and toast to share with an alcoholic and the next entertaining royalty. Her garden lives on at Brodick and her plants here in Waterford. Ambrose Congreve named it well.